The "Twin Peaks" mystery takes on a life of its own as theories are rewarded and invited in an efficiently stuffed Episode 7. Well, this week’s a case for the “Twin Peaks” historians. 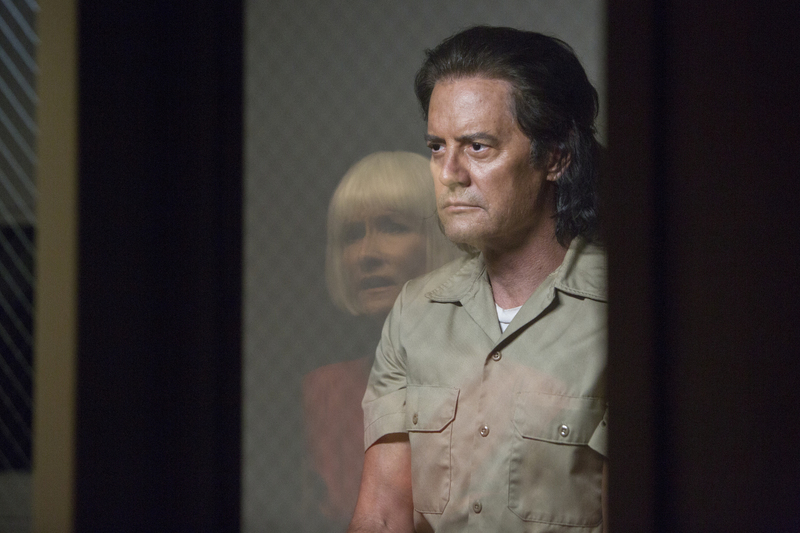 Plenty of “Twin Peaks” 2017 (as we’ve come to identify Season 3, “The Return”) has relied on its past for narrative weight and plot development, but “Part 7” saw more allusions to the original seasons (and “Fire Walk With Me”) than ever, and it started right from the top. The letters Deputy Chief Hawk (Michael Horse) found last week were three of the four missing pages from Laura Palmer’s diary. They spoke of a dream she had in which Annie Blackburn (Heather Graham) told her about “Good Dale” (Kyle MacLachlan) being trapped in the Black Lodge long before it ever happened. Another page suggested Laura knew it was Leland Palmer (Ray Wise), not Bob (Frank Silva), who was coming after her. Diane, Diane, Diane. Her meeting with Bad Cooper marked an emotional high for the episode, and her instinctual understanding that Bad Cooper wasn’t Good Cooper rewarded fans who’ve been invested in that relationship for 26 years (not to mention viewers who felt teased by an all-too-brief introduction last week). Ben Horne (Richard Beymer) played a bigger role this week, even if we understand his significance less than ever. First, his brother (David Patrick Kelly) calls him lost from the woods. Then his assistant, Beverly (Ashley Judd), hears a “hum” in the hotel, and tells him they were sent the old key for the room where Cooper was shot. Something is up at the Great Northern Hotel. Yet for each enlightening answer, there was an equally challenging question that went along with it — an ideal ratio for a mystery train that’s gaining speed but still has a long way to go. Hawk seems closer than ever to putting out an APB for Good Cooper, but how time functions in the Black Lodge (a.k.a. how Annie could have imparted these words to Laura in the first place) remains unknown. The same giant question mark hangs over Briggs’ younger-than-expected body, as well as Diane and Cooper’s suspicious rendezvous at her house. When asked what happened the night they last saw each other, Diane told Director Cole, “You and I will have a talk sometime.” That’s as direct as signals get in Lynch’s world: He’s putting a pin in this story for now, but only because there was so much more to discuss in Part 7. Even with nearly three minutes dedicated to watching a bar-back sweep the floor, the latest hour of “Twin Peaks” was as efficient as it was exciting. It’s important to note that for all the nostalgic ties affecting the new “Twin Peaks,” none of the above allusions to the ’90s felt tired, easy, or inserted solely to appeal to our want for the familiar. Sure, Cole saying, “That’s damn good coffee” felt a tad forced, but even Lynch’s tossed off delivery indicated his dismissal of anything associated to fan service. Consider how technology was incorporated into the episode: Sheriff Frank Truman (Robert Forster) calling Doc Hayward (Warren Frost) on Skype and Jerry Horne (David Patrick Kelly) holding his iPhone out in front of his face while high as a kite were peculiar for a purpose. Each moment invited you into a world once frozen in time, but now unearthed and given new life. Much like Frank punching those keys one at a time, Lynch is deliberately striking nostalgic notes and usurping them. He’s fueling a new mystery with the ashes of an old one, but there’s enough original content to keep the story churning forward. Take, for instance, Good Cooper. We didn’t even see the man uncontrollably posing as Dougie Jones for more than half an hour, but his arrival felt perfectly timed; almost as if Lynch could hear us thinking, “Huh. I wonder what’s going on with Cooper,” and then bam: There he is, grinding a pen into his leather desk topper and letting Janey-E do his talking for him. During his discussion with the cops, Cooper appeared as regressed as ever. His progress has been debated over the last few weeks, but it seemed to have ground to a halt… until he swiftly disarmed Ike “The Spike” Stadtler (Christophe Zajac-Denek). In that brief moment, only foreshadowed by the events of the weeks prior, Lynch showed us just how much of the Old Cooper is left inside of Good Cooper’s mumbling, bumbling body. Moreover, he gave the theorists one more event to anticipate: What with all the news coverage given to “Dougie’s” heroics, it wouldn’t be all that surprising if someone in Twin Peaks saw his face and made a few phone calls. Perhaps this is how Good Cooper will be found. And herein lies the beauty of Part 7: We know better than to start guessing what happens next on “Twin Peaks.” For every guess that comes true (like the unidentified corpse turning out to be Briggs’ body) there’s a scene of inexplicable wonder (like three minutes of sweeping). It’s a tough balance to strike, especially to keep such an eclectic fan base happy, but Lynch is inviting us to speculate and giving us more to examine than anticipated. He’s, dare I say it, plotting a masterful mystery. Scholars, it’s time to dig in.